In the world of intensive deep-sea dredging, size matters – especially when it comes to the working fleet of one of the world’s largest dredging companies. Weighing almost 1t and measuring nearly 2m in width and 1m in length, TENMAT manufactured this oversized tube from our dimensionally stable composite bearing material FEROFORM T814. The tube required over 1km of our proprietary engineering fibre reinforcement, and represents one of the biggest known composite tubes in recent history. This tailor-made tube was subsequently machined into several bespoke half-shell units to support the heavy spud anchoring system of a dredger. TENMAT is recognised as the industry leader, a trusted supplier for dredging, thanks to the superior characteristics of its materials. TENMAT composites are low-friction, long-lasting, and exhibit high strength. This project used FEROFORM T814 – a low friction, dimensionally stable material grade especially designed for marine and hydro applications. FEROFORM T814 has the ability to run dry or water-lubricated and is the preferred choice for marine and offshore applications, including sand-laden waters with high abrasion. TENMAT manufactures tubes and fully machined components in standard sizes, as well as highly specialised items such as this mega-size plain bearing. 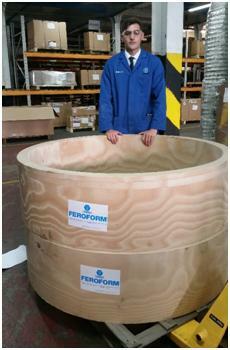 For more information about our FEROFORM T814 grade, please contact TENMAT.